This is the first of our SOLIDWORKS ToolBox tutorials, but if you know my blog you’ll be well familiar with our SOLIDWORKS tutorials for beginners series. After a somewhat lengthy AutoDesk Inventor hiatus, I’m finally writing some more SOLIDWORKS tutorials. 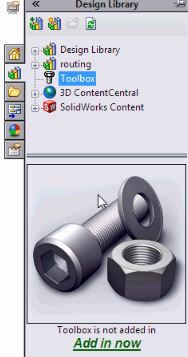 What is SOLIDWORKS ToolBox? 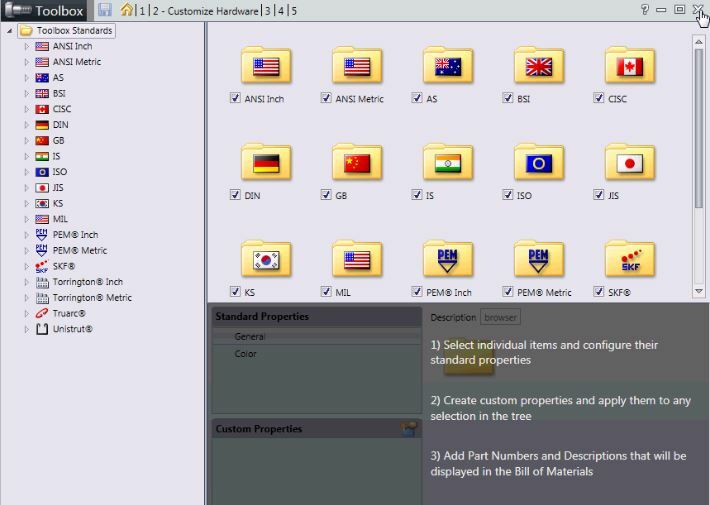 Well, this is a built-in library utility in SOLIDWORKS, which allows you to easily bring in and mate standard parts into your model or assembly. It has some built-in intelligence that makes it easier than using standard part libraries, like a beam calculator and bearing calculator. If you’re not yet using it, I recommend it; at least try it out. It’s a nice feature of SOLIDWORKS. Let’s begin by activating ToolBox. It’s not “added-in” by default, so if you haven’t followed the procedures I show below, then ToolBox won’t be available to you yet. Fear not; it’s all super easy. At the bottom of this article, I’ve got a video embedded, so feel free to check that out also. 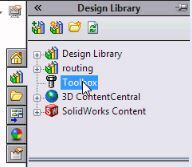 When SOLIDWORKS is done loading the ToolBox library, you’ll see the following displayed under the Design Library nodes in the task pane. 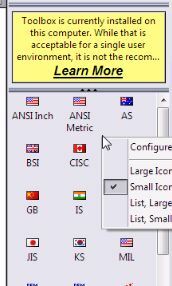 The message states that “ToolBox is currently installed on this computer.” Each of the icons is a library–in the screen shot below, you can see ANSI Inch, ANSI Metric (these libraries below to the American National Standard Institute), as well as BSI (British Standards Institute), CISC (Canadian International Standards Committee) and so on. So, lots of different national standards appear here, all easily identified by flag. When I right-click on any library, I get some visual display options as well as a Configure option. I can show large icons, small icons, list with large display or small display. Currently “small icons” is checked, so below you can see what the small icons option looks like. 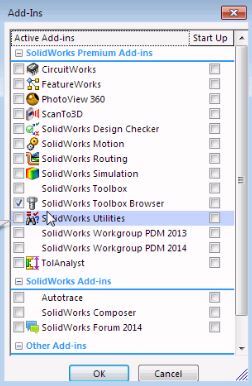 If I choose the Configure option from the right-click contextual menu, I am taken to the customize wizard shown below, where SOLIDWORKS suggests some appropriate actions to me. I can select individual items and configure their properties, create custom properties and apply them to any items in the library, or add part numbers and descriptions that will be shown in the Bill of Materials. I’m going to cancel out of this window by clicking the X in the top right corner. Now that we’ve enabled the ToolBox browser, we need to add in ToolBox itself. Go to Tools on the main menu strip, and scroll all the way down to Add Ins. The following dialog window appears. Take a look at the items regarding ToolBox; there are two: one for ToolBox and one for the ToolBox browser. 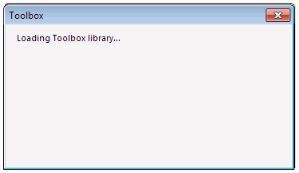 What we need to do here is check the box beside Solidworks ToolBox as well as check the boxes on the right of the items. This, as you can see in the screen shot above, makes the add-in available at start-up. Below, you can see I now have all four boxes checked. Click OK. In Video-Tutorials.Net‘s SOLIDWORKS ToolBox Tutorials course, we show you how to work with each of these options, including the beam and bearing calculator. If you’re interested in viewing some of our video tutorials from this course, please visit our youtube channel.